The Murchison Cemetery is on the north side of the road. It is also neglected. Together they are sometimes called the Twin Cemetery. This cemetery is supposed to be large but it is impossible to see the boundaries. There is 1 family plot with cedar trees that is about 100 feet south of the road. It is well kept. William Patton Honaker donated 2 acres of the land for this cemetery with the deed listed in Vol 16, p 501. It is interesting to note that there are no Honakers buried here, nor are any of the trustees for the cemetery buried here. They are all buried in the Farmersville IOOF Cemetery. The deed states that there is a Honaker family plot. The person mentioned in the family plot is not here any longer either. There are a couple of former Honaker slaves buried in this cemetery. COLLIN COUNTY CEMETERY INSCRIPTIONS II contains a plat map for the cemetery. There are several large empty areas shown. 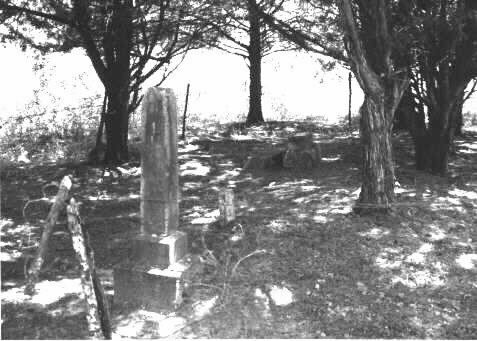 I have heard that when the Farmersville IOOF Cemetery opened, bodies were transferred to it from family cemeteries. That is probably why there are no Honakers buried here and why there are such large empty areas in the cemetery. There was once a community of Honaker Chapel that was southeast of Farmersville. This cemetery is extremely overgrown and neglected. The Sheriff's Department cleaned it numerous times. The road was once part of the Farmersville-Bonham Road.